Welcome to Thrive.ink! I'm Morgan and he's James. 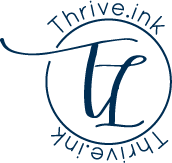 We run Thrive.ink Event Planning! Are you a mom getting ready for your little one's birthday party with big dreams and no time? Do you want to plan a nice shower for a friend, but find yourself overwhelmed? Planning an anniversary or holiday party, but creativity is just not your strong suit? And more! Contact me and I can be as much or as little a part of the process as you need. I want you to have the best event possible and for it to be stress free for you!